Tropical paradise at Nihiwatu Resort in Indonesia. 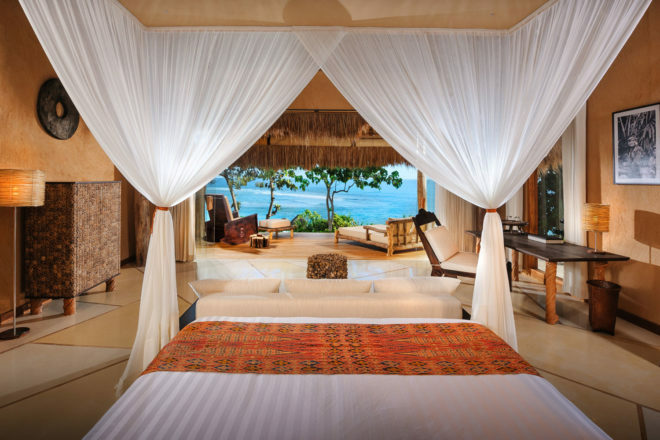 Seclusion, surf and style combine to create this luxurious hideaway – the only resort on Sumba Island, Indonesia. It is the only resort on isolated Sumba Island, which is best known for its annual Pasola horse festival where clans charge each other with wooden spears and headhunting practices, until a few decades ago. Set on a 438-hectare estate peppered with verdant rice terraces and grasslands interspersed with pristine rainforest, Nihiwatu has soaring views over Sumba’s spectacular coastline with a world class surf break on its doorstep. Accommodation is in 19 thatched roof villas which have been hand-built using bamboo, stone and alang-alang grass, then finished with rare ikat textiles made by local tribes-people. While the luxury is understated, the philosophy at Nihiwatu is pure sustainability, with room rates used to assist poverty alleviation, malaria eradication and clean water supply to villages on the island. Meaning you can indulge while being assured that your holiday money is going to a good cause.